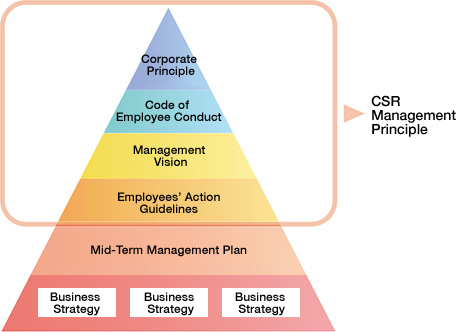 We promote CSR management based on the global standard "ISO 26000". *The "Hitachi Spirit" implies the Hitachi founding spirit of harmony, sincerity, and pioneering spirit, but it further enhances them and has the fundamental principles of making contributions to society via development of outstanding autonomous technologies and products. Hitachi Solutions promotes CSR through its main business activities based on the CSR Policy of the Hitachi Group, which comprises eight policy items, and ISO 26000, an international guideline on organizational social responsibility. The corporate principle of Hitachi Solutions, as may be gathered from the name "Solutions", is committed to making a contribution to the resolution of issues faced by customers and the global community through utilizing our various businesses, human capitals, and other management resources. We believe that realizing this corporate principle above all is our CSR. While constantly thinking of ways to contribute to the resolution of various social issues via IT, we will provide solutions that generate value together with society. 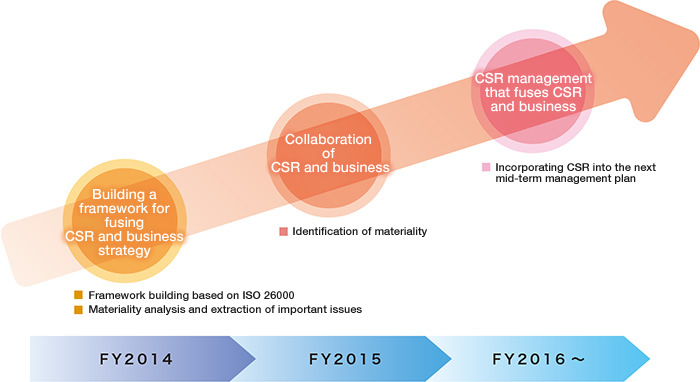 With the objective of promoting the fusion of management and CSR, Hitachi applies ISO 26000, which is the global standard for social responsibility, as its guideline for promoting CSR throughout the entire group. As a member of the Hitachi Group, Hitachi Solutions also promotes CSR management based on ISO 26000. We aim to contribute to the sustainability of society while identifying our company's materiality in various social issues and pursuing what we can do. We will take concrete measures to build a framework for fusing management and CSR with a view to compiling the next mid-term management plan from fiscal 2016. In order to fulfill its responsibility to stakeholders while maintaining soundness and transparency in management, Hitachi Solutions is working to strengthen corporate governance as well as striving to thoroughly implement legal compliance and enhance its risk management structure. Hitachi Solutions recognizes that the strengthening of corporate governance is an important management issue, and has established the Hitachi Solutions Code of Conduct for executives and employees to follow. Following its delisting and conversion to a wholly owned subsidiary of Hitachi, Ltd., since April 1, 2010, Hitachi Solutions has become a Company with a Board of Auditors, providing simplicity in organizational structure and prompt decision-making. In addition, an Executive Officer System has been set up to ensure that management speed continues to be maintained. The Board of Directors consists of nine board members (including four external directors) and four auditors (including two external auditors). Meetings are in principle held once a month to carry out important decision-making and supervision of directors' and executive officers' performance. The management conference is comprised of senior managing and other higher ranking directors as well as full-time auditors. The meeting is in principle held once a month. At the meetings, important matters relating to decisions delegated by the Board of Directors to executive officers are discussed, reports are made, and final decision-making by the President and CEO takes place. The Board of Auditors consists of four auditors (including two external auditors). Each auditor carries out auditing functions in accordance with the division of duties, and audits the performance of directors, reporting or noting the status or results of performance to the Board of Auditors and the Board of Directors. The expansion and improvement of our internal control system not only enhances management efficiency and ensures the legitimacy of corporate activities (proper financial reporting, compliance, etc.) within corporate governance, but it is also critical to the fulfillment of our social responsibilities. Hitachi Solutions has adopted basic policies for internal control system building in accordance with corporate law and has established the Internal Control Committee as the executive organ for thoroughly implementing internal control within the Group. In addition, as a member of the Hitachi Group, we are appropriately building and advancing our system of internal controls relating to financial reporting, in compliance with the United States corporate reform law, the Sarbanes-Oxley Act (SOX), and the Financial Instruments and Exchange Law (J-SOX). Hitachi Solutions has been striving to thoroughly propagate legal compliance by establishing the Compliance Management Department as an office specializing in fair and transparent corporate conduct. In addition to doing this, Hitachi Solutions has established its Anti-Monopoly Law Observance Regulations. Furthermore, it has introduced a Legal Compliance Reporting System to prevent illegal and improper conduct and provide for prompt corrective action. 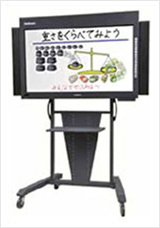 The system is extensively applied to all employees of Hitachi Solutions, including former employees and temporary staff, as well as employees and temporary staff of the entire Hitachi Group and its business partners. Furthermore, since February 2003, Hitachi Solutions has regularly held legal compliance education for all its department and section managers and sales personnel. Starting FY2009, it decided to hold an Ethics Month in October of each year to promote further strengthening and thorough implementation of corporate ethics and legal compliance. Hitachi Solutions has established a Business Continuity Management (BCM) Committee for reinforcing its risk management system, which determined the company's business continuity program. In addition, as part of our crisis management, we have introduced a support system to confirm the safety of employees and their families during a crisis. Hitachi Solutions has established comprehensive Basic Information Security Guidelines with the goal of properly managing all information system assets related to customer information, based on an awareness of the importance of their proper handling. All Hitachi Solutions employees are thoroughly versed in these guidelines. Making the prohibition of removing confidential information from the workplace the main rule of information security, Hitachi Solutions has set up the Confidential Information Administration Division and is striving to promote and enhance security measures. Hitachi Solutions' policy is that quality is top priority in attempting to supply reliable solutions that meet the diverse needs of customers. The company operates quality management systems, and in the area of product development and services operates quality assurance (QA) departments that function independently from business divisions. The QA departments are responsible for pursuing quality assurance and quality control targeting processes, products and projects. These efforts cover the entire lifecycle from upstream processes to design, manufacturing and testing through to shipping, operation and maintenance and are conducted from a customer perspective. In addition, Hitachi Solutions implements a company-wide quality improvement program that is designed to enhance development processes and encourage employees to focus on quality. Hitachi Solutions endeavors to build good partnerships with all suppliers and to improve the level of mutual understanding and trust. The company is committed to making positive social contributions by establishing strong ties and close communications with suppliers to realize win-win relationships at a higher level. Hitachi Solutions regularly shares its corporate and business division strategies with suppliers, developing the strategies from a medium- and long-range business perspective. We regularly engage in high-level information exchange with business partners to maintain and improve the level of trust with suppliers. We conduct supplier briefing sessions for management to brief suppliers on our business strategies, and for business division GMs to explain their areas of focus and approach to working with business partners. Upper management shares their frank views on business strategies and meets with suppliers through informal gatherings to cement communications. We share information on technology trends and new fields that are in line with our business strategies, implementing solution-based strategies, including the development of human resources. We are strengthening our partnerships with international business partners as we seek to expand our business across the globe. We communicate with international business partners through regular meetings and leverage our PartnerLink Service communications platform, which enables personal communication across remote distances. Hitachi Solutions incorporates socially responsible practices throughout its supply chains in contributing to a sustainable society as a member of the Hitachi Group. We work with business partners to gain their cooperation in our procurement strategies so that we all meet our social responsibilities. We issue the Hitachi Group Supply-Chain CSR Deployment Guidebook to business partners so as to facilitate their understanding of our guidelines and promote socially responsible practices. Hitachi Solutions has asked its major suppliers to cooperate with a self-assessment questionnaire survey on socially responsible practices, sending it to suppliers with the Hitachi Group Supply Chain CSR Deployment Guidebook. The survey is designed to assess the degree to which suppliers are practicing the Codes of Conduct, standards, and socially responsible practices outlined by Hitachi Solutions. The survey responses are currently being collected from suppliers. Hitachi Solutions takes measures to prevent improper transactions, in accordance with the Hitachi Group Codes of Conduct that outlines common expectations for the conduct of the Hitachi Group. Additionally, suppliers are expected to comply with all relevant laws and regulations in procurement transactions and execute their operations according to the letter and spirit of the law. Procurement departments at Hitachi Solutions are given exclusive authority to issue a request for quotation (RFQ) and a purchase order, in order to prevent improper transactions. In some instances, procurement departments inspect goods that are delivered directly to third-party locations to check for irregularities and problems. Under the Hitachi Group Green Procurement Guidelines, Hitachi Solutions procures components and materials that are 100% compliant with the Restriction of Hazardous Substance (RoHS) Directive for regulation of chemical substances. These components and materials are used in core products such as StarBoard interactive whiteboards and other hardware products in our effort to supply environmentally friendly products.